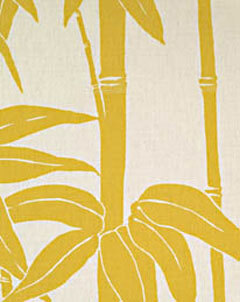 Sunshine from Lulu DK is now available in a linen blend fabric, in addition to the wallpaper. Shown above is the chocolate colorway, my favorite. In designing The Parker Palm Springs, Jonathan Adler was inspired by a fictional muse: the chic globe-trotting collector Mrs. Parker. 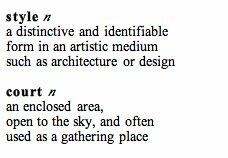 To create a resort that feels more like a luxurious but fun residential estate -- not an intimidating boutique hotel -- Adler used pieces that Mrs. Parker might have picked-up in Morocco or other distant locals. The image above, from The Parker, shows his clean-lined modern bohemian mix. A real life adventurous spirit, Atlanta resident Dorothy Methvin McClatchey, traveled the world collecting jewelry and decorative arts. Her collection of over 500 objects from Central and Southeast Asia, Africa, Europe and Melanesia is now on permanent view at Fernbank Museum. Located in a stately old residential neighborhood, Druid Hills, Fernbank is a great winter Sunday afternoon destination. 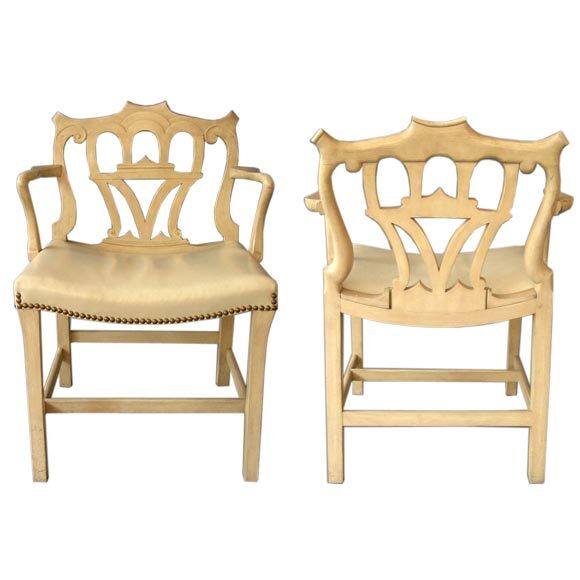 BTW: Visit Bravo online to see video interviews with Tim Gunn and Jonathan Adler. 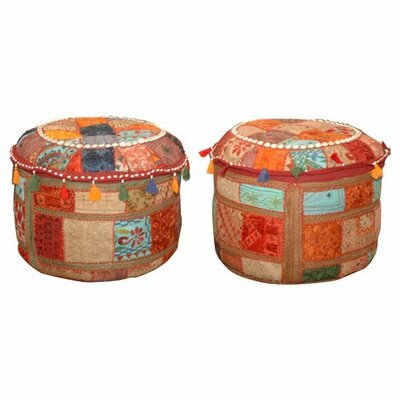 The long-awaited Top Design series premieres tonight at 11/10 c.
Glancing at Anthropologie's February catalog, it looks like Moroccan and Portuguese inspired patterns will remain big on the 2007 style scene. For a touch of Moroccan flair in a room, I love these poufs above, available through Chapman Radcliff. Such pretty colors and perfect for someone who wants to throw a spot of bohemian spice into an otherwise clean-lined interior. $300. 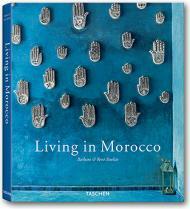 For more lush Moroccan style, see Taschen's Living in Morocco/ Vivre Au Maroc, shown above. 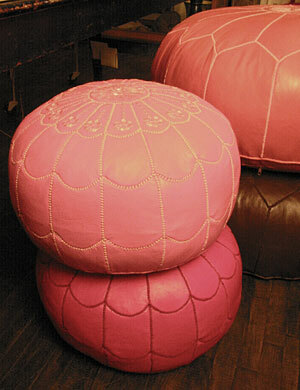 The pastel leather Moroccan poufs, above, are still available through John Derian. 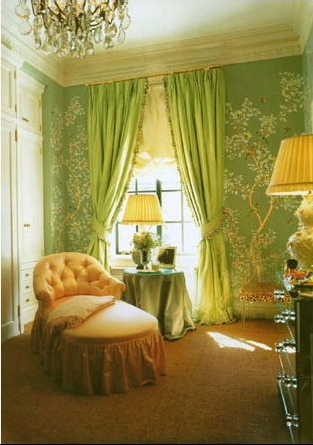 I first saw them mixed with French antiques in Elle Decor, 2005, when Candace Bushnell's apartment was featured, as shown below. Below, more evidence of the trend: J. 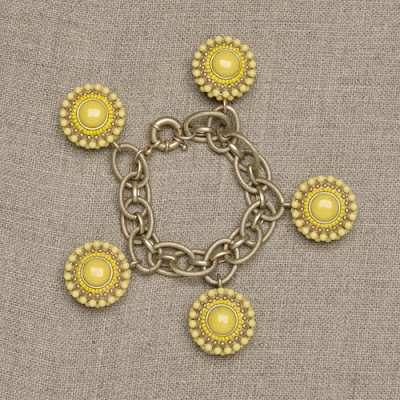 Crew's Moroccan bauble bracelet. 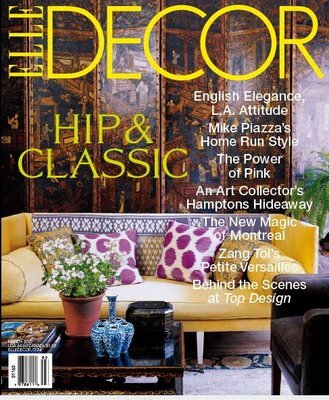 If you are a fan of Michael Smith's work, you will love the March issue of Elle Decor. Smith's own home is on the cover and inside there is a nice long 11-page spread. It's exquisite. For those who don't subscribe, the March issue should hit newsstands February 6. 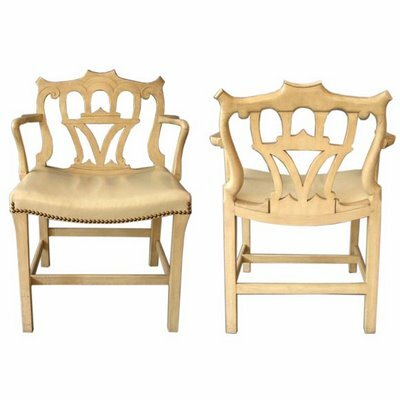 If you want to soak-up more grand but comfortable English country style houses like Smith's, try Nancy Lancaster: English Country House Style. The name Maugham is on my mind because of the film, The Painted Veil, based upon the book by W. Somerset Maugham. 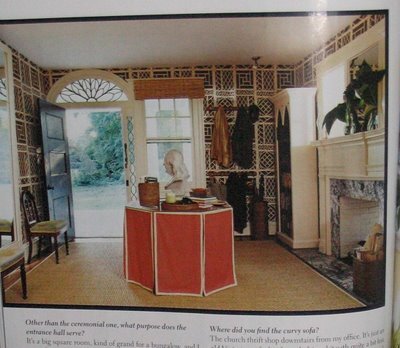 For a time, the writer was married to Syrie Maugham, one of the last century's most infamous interior decorators. 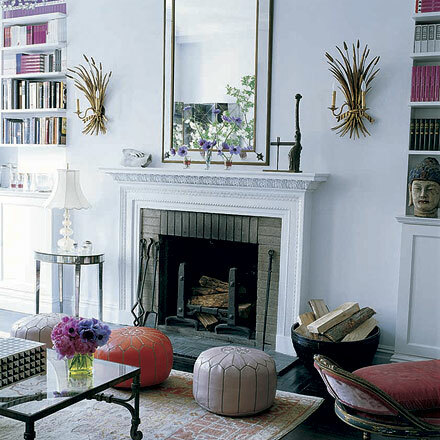 Syrie is legendary for creating an all-white salon at her London home in 1927. Considered revolutionary at the time, she dramatically unveiled the room to her friends at midnight, and Harper's Bazaar loved it. Like Elsie de Wolfe, Maugham rejected those heavy, dark interiors seen during the previous Victorian era. 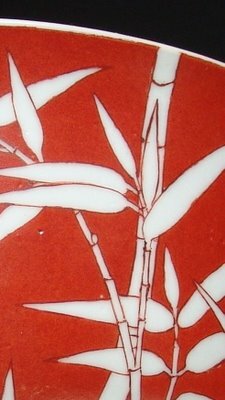 A few years ago, the 21st-century firm, Studio Printworks, used vintage photographs and fragments to recreate a favorite wallpaper design of Maugham's that resembles a modernist tree-of-life pattern. 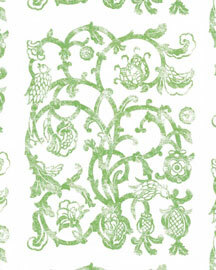 Called "Syrie," it is shown above, second from the top, in grass-green and ivory. In October 2001, House & Garden used this pattern in a recreation of one of Maugham's famous bedrooms, seen top. 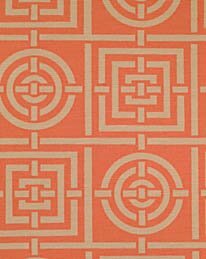 This year Acanthus Press is expected to release a new book about Syrie Maugham as part of its ongoing 20th Century Decorators series. 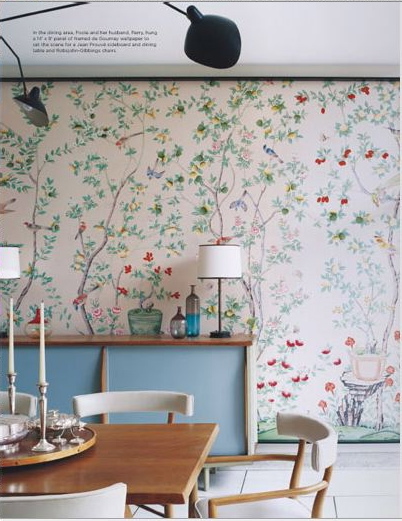 Gracie handpainted wallpaper based upon style SY-21, designed for Aerin Lauder as seen in Vogue January 2001. 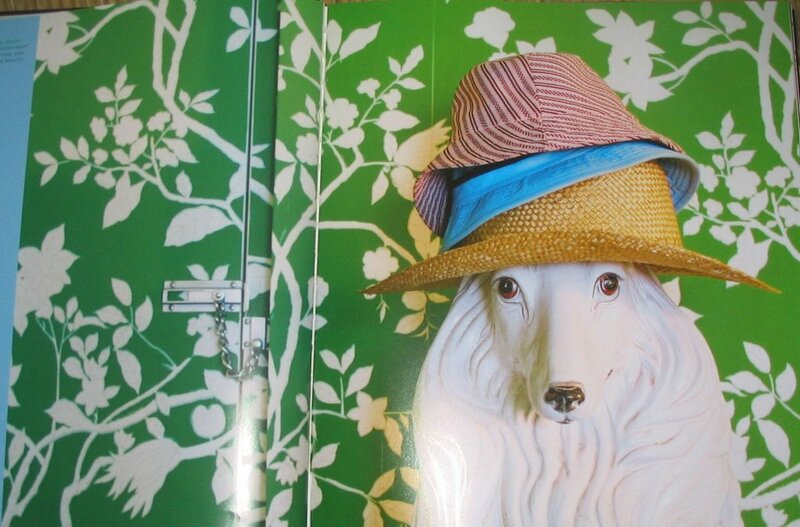 For some reason when I was little, I thought a big white ceramic dog would be the most elegant home accessory. 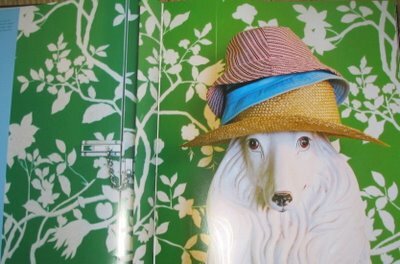 Now that these are in vogue again and I could buy one for myself, I'm kind of over them -- although I think Adler's use of this dog by the door is adorable. 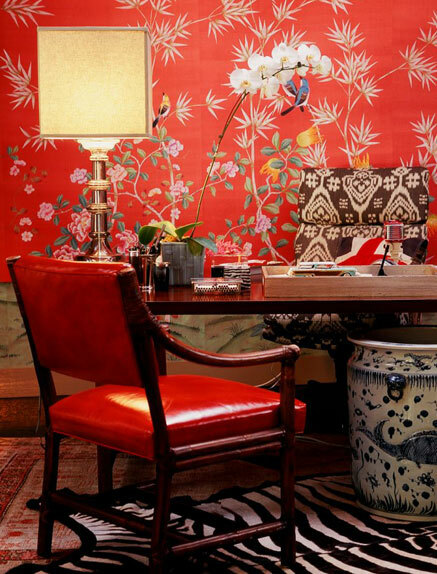 What I do currently covet is wallpaper. 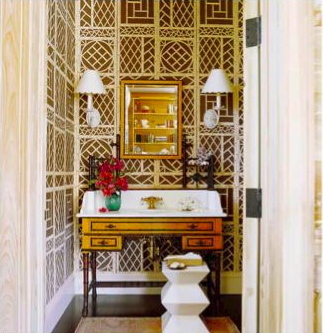 In a small entry -- or for those lucky enough to have one, a walk-in closet or dressing room -- I love to see every inch of wall surface papered including the backs of doors. 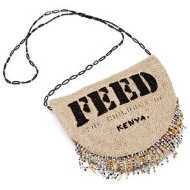 This really creates that jewel box feeling. 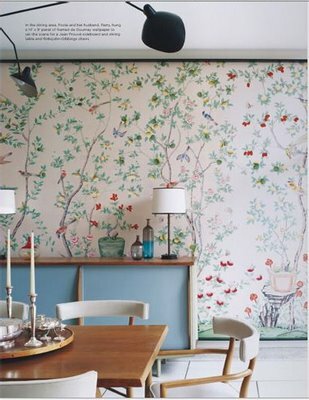 Above, North Carolina decorator Barrie Benson's commitment-free alternative: one enormous framed piece of de Gournay chinoiserie paper is juxtaposed with mid-20th-century modern furniture, as seen in the February 2007 issue of Domino. Podcasts related to decorative arts and design, with video, are available from both Christie's and Sotheby's. 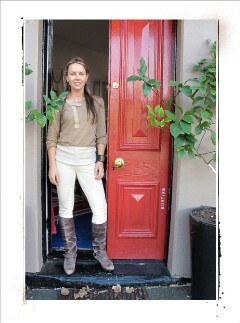 To find them visit the Apple iTunes store and type "Christie's auction house" or "Sotheby's" in the search box. 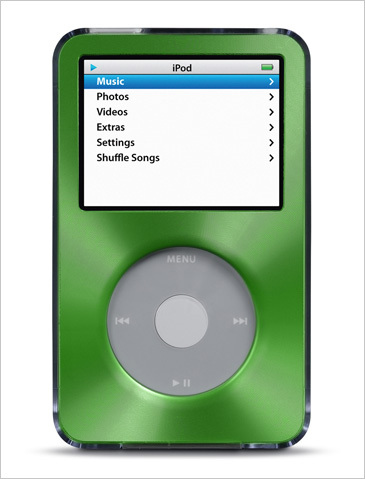 Image above of iPod is from Apple. If you saw the December 2006 issue of World of Interiors, you know Andy Spade is a serious art collector. He is also drawn to books, especially those with graphic, intriguing covers, and he recently organized an exhibition titled "An Argument for Looking at Books Instead of Reading Them," installed at Colette in Paris, December 2006. The installation included a wide array of book jackets -- some taken from vintage art exhibition catalogs and others from rare editions. Images from the exhibition can be seen on the Kate Spade site in "Behind the Curtain." 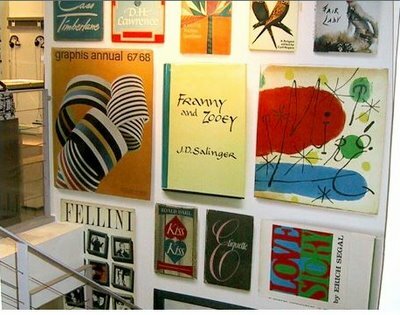 A grouping of very vivid framed book jackets could be an interesting focal point in a home too. Today, legendary Australian designer Florence Broadhurst is on my mind because I just received from Anna Spiro -- another spirited Australian designer -- the most generous and fun "design care package," which included a few Broadhurst fabric swatches. In the last few years there has been a global rediscovery of Broadhurst's work. 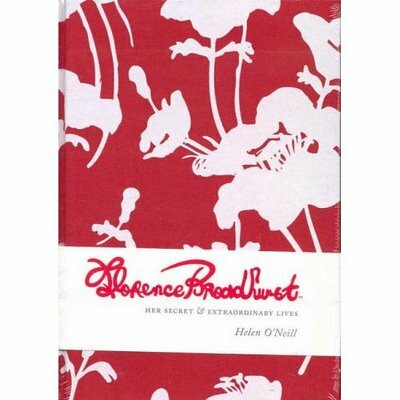 Author Helen O'Neill discusses this phenomenon in a book due to be released in the U.S., in April, from Chronicle, Florence Broadhurst: Her Secret & Extraordinary Lives. 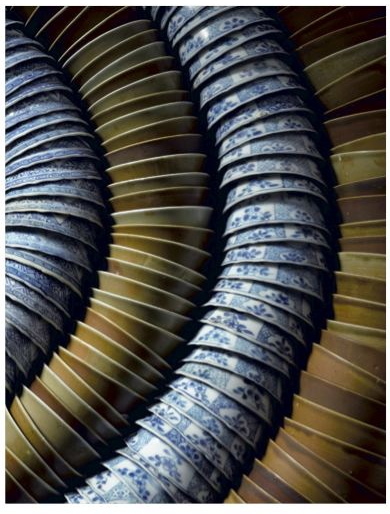 According to the publisher, this book combines lush images of Broadhurst's innovative, Asian-inspired fabric and wallpaper along with narrative about the designer's complicated life story. 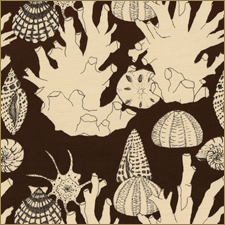 To view a range of Broadhurst's patterns as well as home accessories made with her textiles, or to learn more about the eccentric designer, visit signatureprints.com.au. 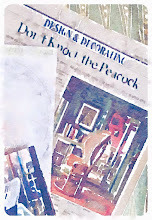 California retailer, Weego Home offers Broadhurst fabric stretched to be hung on the wall as art. 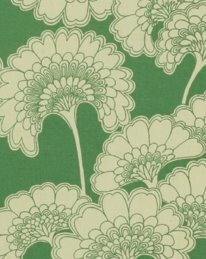 Walnut Wallpaper, also in California, carries Florence Broadhurst wallpaper. 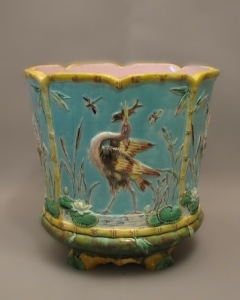 Above, a circa 1875 English majolica cache pot, a sample of the wares offered by one of the Antiques Show's participating dealers, Jerry S. Hayes. If you happen to be in Atlanta this week, don't miss the 36th Annual Cathedral Antiques Show. The show takes place Thursday - Saturday, January 25 - 27, at the Cathedral of St. Philip, 2744 Peachtree Road. Even if you don't plan to make a purchase, this is a great place to educate your eye, and your $15 admission ticket benefits a very worthy cause, The Truancy Intervention Project. Show hours are 10:30 a.m. - 7:30 p.m., Thursday - Friday, and 10:30 a.m. - 4 p.m., Saturday. Lectures and appraisal services are included in the schedule of events. 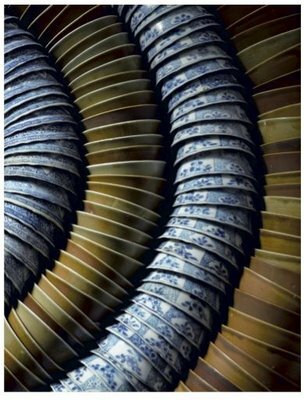 Next week, January 30-31, Sotheby's will sell over 76,000 pieces of fine 18th-century Chinese porcelain recovered from the Ca Mau shipwreck, in the South China Seas. 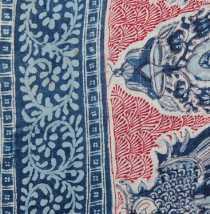 Although the auction will take place in Amsterdam, Sotheby's site features a fascinating video about the recovery effort and the wares that were found, as well as an online sale catalog. It's worth a look. Two important auctions of Chinese export art and porcelain take place this week at Christie's New York. 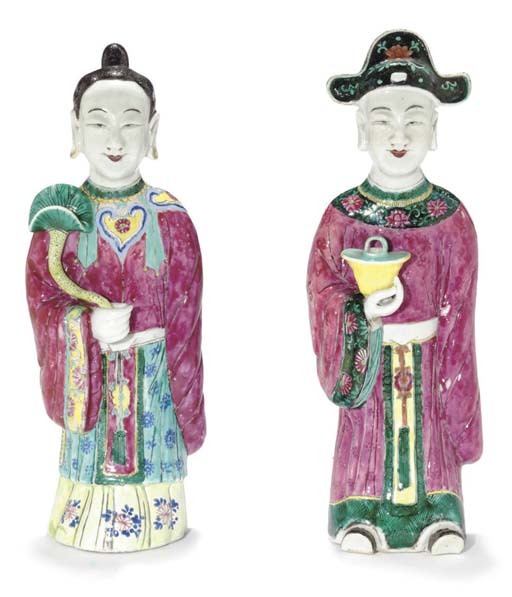 The Hodroff Collection: Chinese Export Porcelain from the Collection of Leo & Doris Hodroff will be auctioned January 24, and the Chinese Export Art sale is January 23. 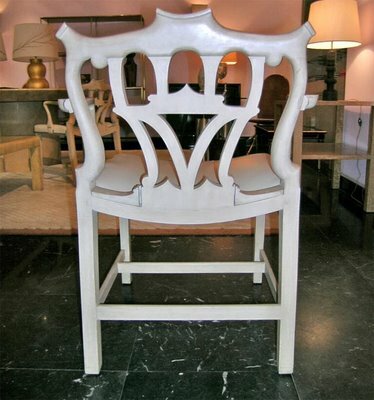 Even if you have no plans to place a bid, browsing the online auction catalog is fun and educational. It's filled with vivid images and also free and easy to browse. 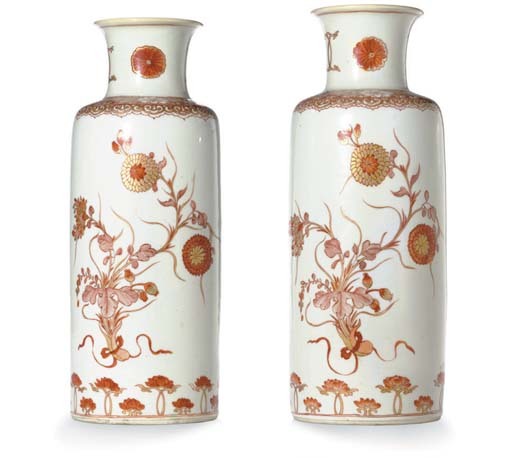 Pictured top to bottom: A pair of 19th century Famille Rose court figures, and a pair of Kangxi iron-red and gilt sleeve vases, freely painted with two ribbon-tied chrysanthemum bouquets, with a border of lotus below. 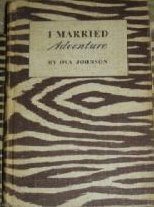 If there is a "top ten" list for books seen most frequently on coffee tables and shelves, in homes featured in all the various shelter magazines, I think Diana Vreeland's "Allure" and Osa Johnson's "I Married Adventure" must surely be the top two. 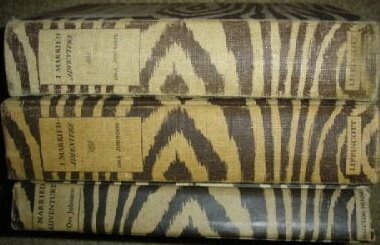 Both are interesting books with highly decorative covers, so I see the appeal. Has anyone else noticed? 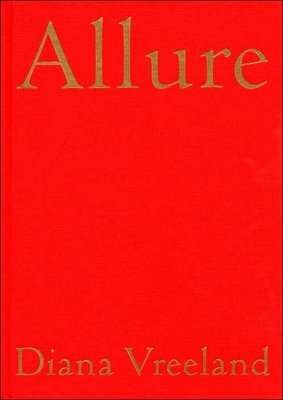 Allure is still available from Amazon but to find Johnson's book with the original zebra printed cloth binding, try eBay or Paris Hotel Boutique. Just wanted to end the week with one more image of Betsy Burnham's work. 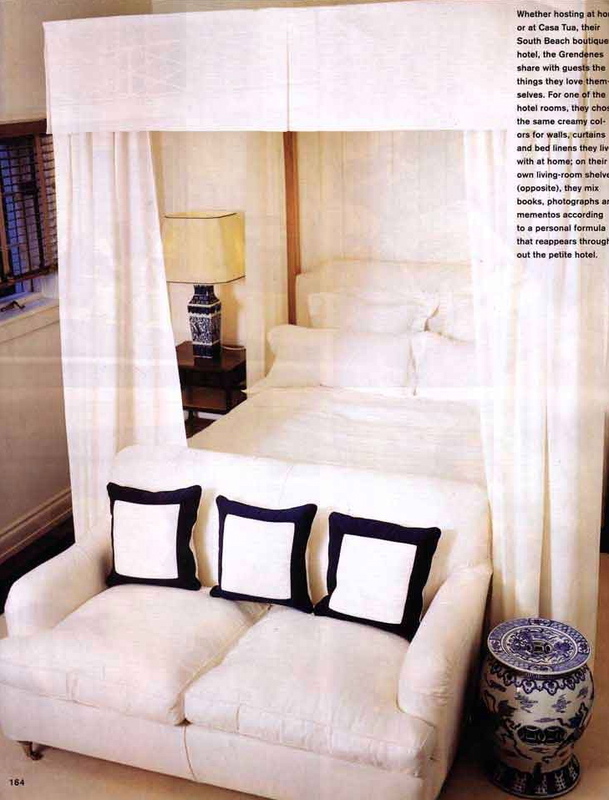 The photo is by Lisa Romerein, and it was originally published in the Fall 2005 issue of InStyle Home. 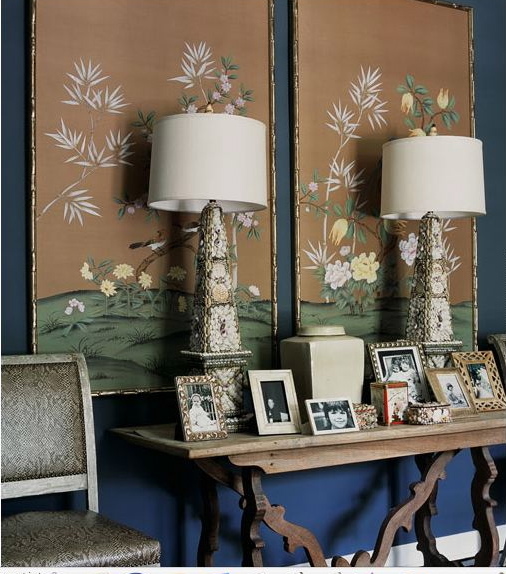 This vignette appeals to me, not only because of the pair of framed chinoiserie wallpaper panels (which of course I'm in love with) but also because of the layers: the pair of shell-encrusted lamps, the rich wall color and the family photos. Although there is a lot going on here, to me, the symmetry keeps it from being too much. 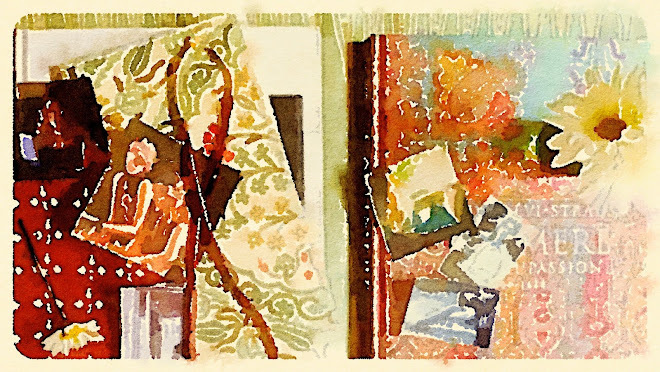 I think this makes a nice follow-up to my post, Framing Wallpaper Panels. I just came across a great source for vintage design books, Paris Hotel Boutique, via design watcher. Unlike similar sources I've mentioned before, Paris Hotel Boutique lists prices, which is so helpful. And the selection of Cecil Beaton books is strong. 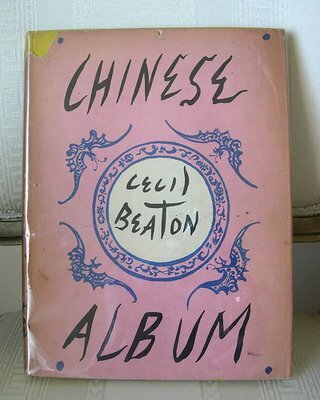 A first edition of Beaton's 1945 "Chinese Album" costs $120, while "Beaton in Vogue," another first edition from 1986, is $150. 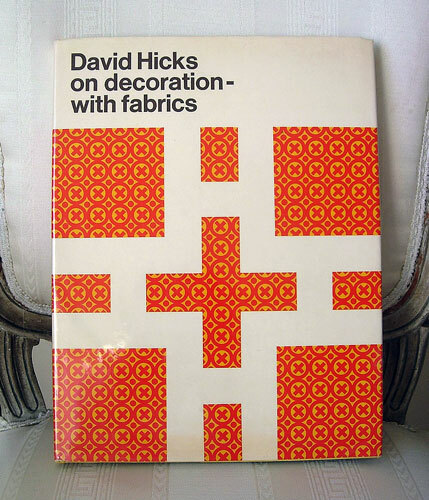 "David Hicks on Decoration with Fabrics," 1971, first edition is also $150. 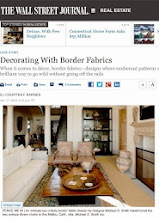 Apartment Therapy was among the first to feature designer Betsy Burnham, and currently her mail-order decorating services are mentioned in the February Domino. But I just had to share this image, above, of a Benedict Canyon home office done-up by Burnham. I adore the layers -- the red chinoiserie wallpaper (which seems like a little nod to Diana Vreeland) mixed with the zebra rug, brown patterned chair and red leather open-arm chair, as well as the large Chinese export style pot, and the silver lamp. So inviting! 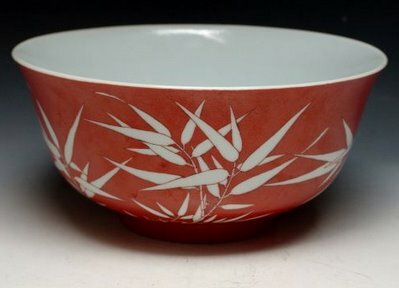 Here's an item for my wish list: a Qing dynasty, Daoguang period (1821-1850) bowl, decorated with white bamboo against a brick-red ground, and available through Gotheborg.com. If you are a design or art history student, or a collector, Gotheborg is a must visit. 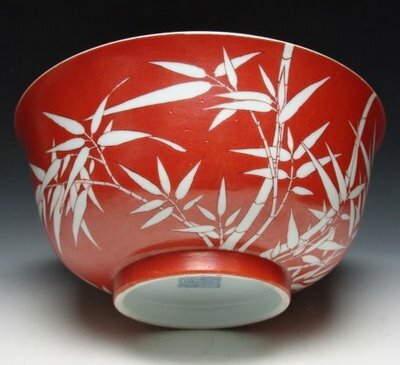 The site offers what is believed to be the largest database on Chinese and Japanese antique porcelain available on the Web. Over the weekend did you catch Giada's new show, Weekend Getaways? If like me you were enchanted by one Miami restaurant she visited, Casa Tua, you may enjoy browsing the oh so charming site of this boutique hotel and restaurant. 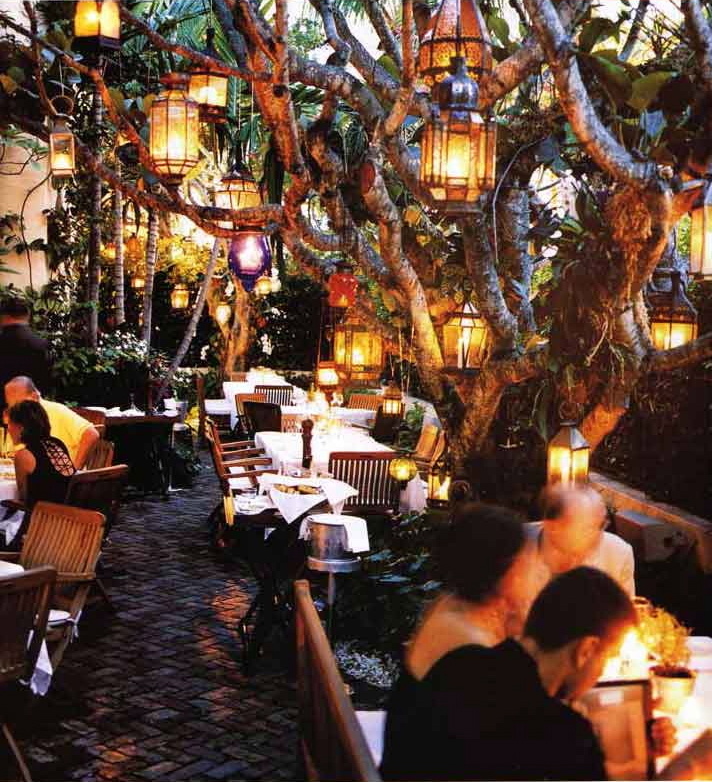 Located in a 1925 Mediterranean Revival residence, Casa Tua's ambiance is quite different from the harder-edged Art Deco style that pervades Miami. Casa Tua is highly sophisticated but warm and it exudes an Old World, laid-back glamour. Images above from Town & Country October 2003. 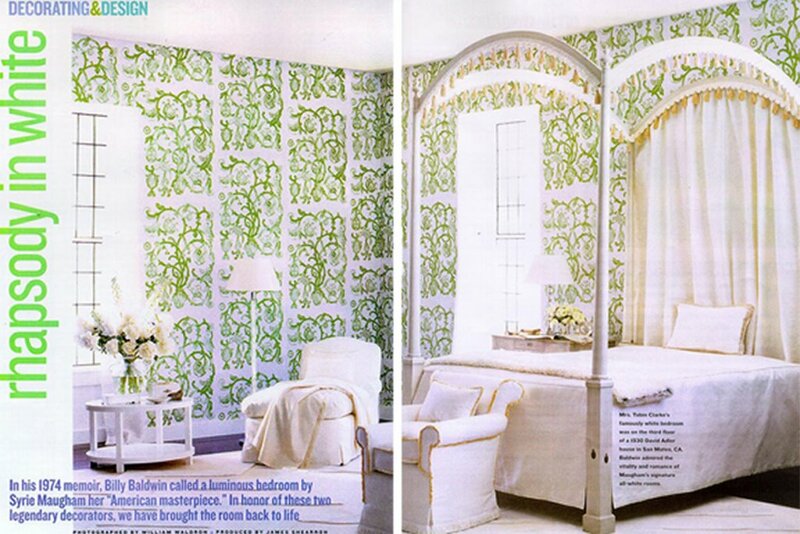 If you are a fan of Tom Scheerer's work, or specifically his Lyford Trellis wallpaper for Quadrille in brown, pick-up copies of the February issues of House Beautiful and Elle Decor. 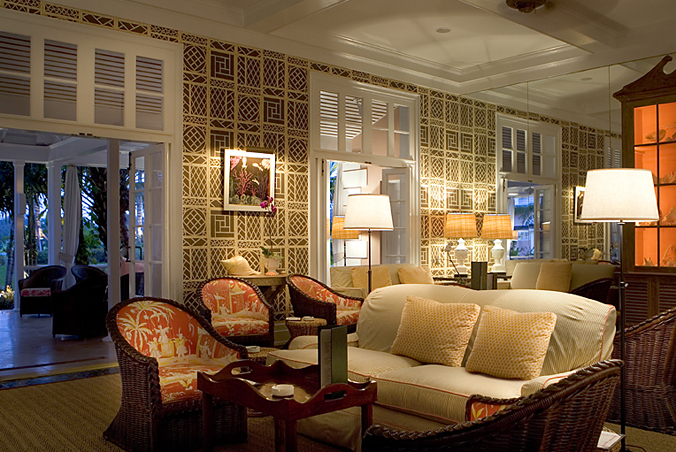 Featured in HB is the most lovely bungalow decorated by Scheerer in mainly yellows, oranges, white and dark chocolate brown. The front hall is probably my favorite room in the home. Shown above, it is covered in the graphic Lyford paper. 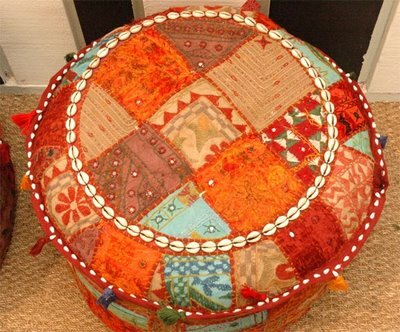 The other great focal point in the entry is the octagonal center table skirted in shrimp Oxford cloth from Bailey & Griffin. 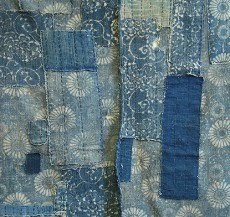 Don't you love how Scheerer trimmed the shrimp fabric? 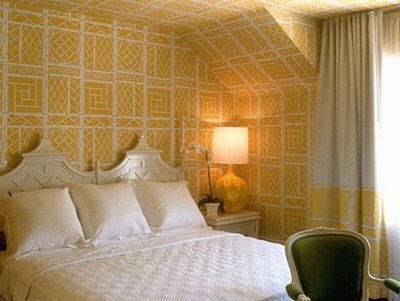 Does anyone know if Lyford Trellis, in yellow, is the paper used in the bedroom above designed by Kelly Wearstler for Maison 140? 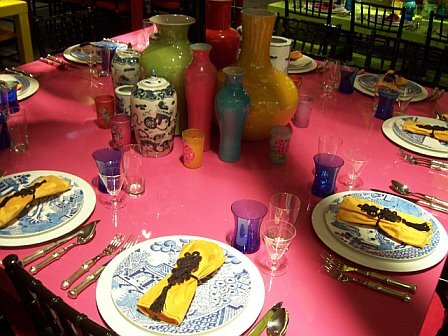 Above, designer Han Feng created this contemporary Chinese New Year table for Martha Stewart. Images above, courtesy of Alli, show tables designed by Elle Decor Editor in Chief, Margaret Russell, for Dining By Design, Atlanta 2006 to benefit DIFFA. 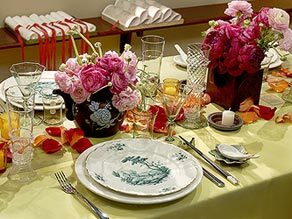 Hosting a dinner party, luncheon or even a kids' party inspired by Chinese New Year celebrations offers the chance for another big decorative moment, between the let-down after the holidays and spring. February 18 is the official date this year. With hallmarks of Chinese New Year celebrations including paper lanterns and the colors red, gold, pink and orange, the possibilities are endless for a fun, chic event. 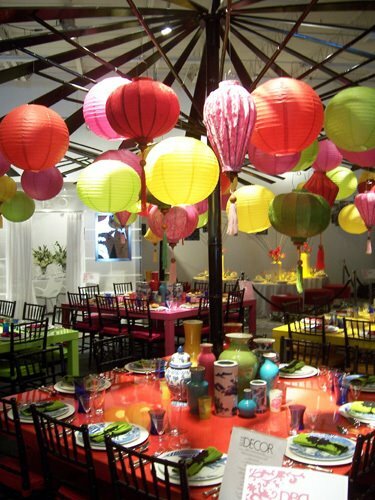 For a large array of lanterns and party supplies, visit China Sprout (via Southern Accents) or Pearl River. Plum Party has a stylish selection of Chinese New Year offerings, but items are quickly selling-out. The turquoise and pink vases used above on Margaret Russell's tables are available from Jayson Home. The plates are by Robert Dawson for Wedgwood, in the After Willow pattern.